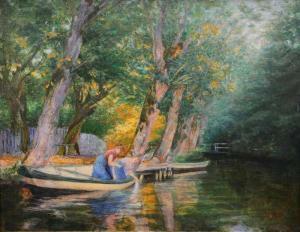 Find artworks, auction results, sale prices and pictures of Carl Oderich at auctions worldwide. Oil/canvas, 58,5 x 74 cm, lo. ri. sign. Oderich. - Exh. : Museum Hagenow 2006. - History, portrait a. landscape painter, master student of H. Makart in Vienna, before he studied at the Karlsruhe academy under des Coudres a. Gussow as well as in Berlin under Wolff a. Schaper, in 1886/87 he travelled Egypt, became a successful portrait painter of the Vienna aristocracy a. portrait painter of the local upperclass after moving to Hamburg in 1894. - Mus. : Hamburg (Kunsthalle, Mus. f. Hamburg. Gesch.). - Lit. : Boetticher, Thieme-Becker, Bénézit, Rump, Der Neue Rump a. others.